Many years ago, when I used to play a little baseball, we had a saying “Have a day” when a teammate was hitting on all cylinders. I guess it was the modern equivalent of “in the zone.” Well, August 6, 2003 could have qualified as I enjoyed a successful multi-species double header of sorts. Original “boxscore” from a full day on the water. The day started off with an early morning wade in the creek with Dad as detailed in the excerpt below. 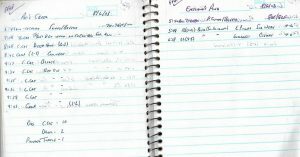 The report and pics were originally submitted to family and friends back on August 21, 2003. 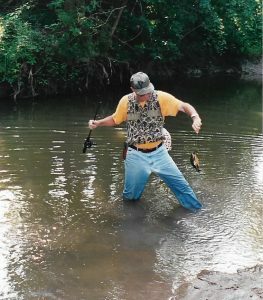 August 6 (Pat’s Creek) – As a break from the fast-paced world of bass fishing, Dad and I headed for Pat’s Creek armed with two dozen dew worms for some multi-species angling. 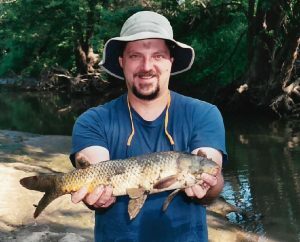 Our efforts were rewarded with seventeen catfish, two carp, two freshwater drum and a turtle. Top catfish was my 2-3 and top carp was my 2-7. Dad somehow caught the turtle. We were standing above a deep hole when he jokingly said, “I’ve got a turtle” as he reeled in his bait. As I was downstream on his left, I jokingly said, “Don’t reel it by me.” Although neither one of us was serious, sure enough, here came a painted turtle past me as Dad reeled it in. 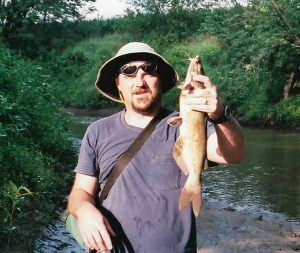 I guess we should have tried joking about having a ten-pound catfish hooked. Overall, a very successful outing. Our worms lasted right up to the last hole, no busted shins, no falls and I didn’t get lost in the cornfield. The nightcap of my split fishing double header involved bass chasing on an old favorite pond with my brother, Brent. Once again, an excerpt from the same report included below. August 6 (Emstrom’s Pond) – Brent called me up to see about hitting Emstrom’s for a couple hours. Julie and I had no plans so I figured there’s no sense in passing up a second fishing trip. We fished from around 5:30-7:30 pm and caught two bass. They weighed a total of 5-1 and one only weighed 12 ounces. The other was a 4-5 that was actually skinny. Its mouth and head were very large and its length was 22″. Either sick or malnourished, the fish could have weighed considerably more, but I can’t complain. Despite the 82 degree water temperature, the bass was extremely energetic as it cleared the surface when it slammed my buzzbait (silver glimmer) and again during the fight. This bass is now the Top Buzzbait Bass, eclipsing Dad’s 3-15 from Emstrom’s Pond on 9/8/01. 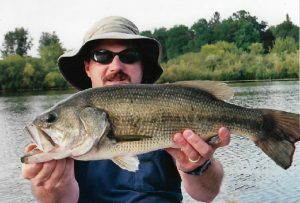 Dad’s 2-3 from August 5th lasted as Top Bass of August 2003 for approximately 36 hours. My 4-5 would relinquish Top Bass honors in less than a week. Thanks for the phone call, Brent.